Why has Afghanistan changed in a few decades from being a relatively relaxed and tolerant society to one of the most authoritarian and fanatical societies in the world? And why were women allowed to wear miniskirts in Afghanistan in the 1960s while they were forced to wear burqas under the Taliban? This dramatic social change is just one of many examples of social developments that my new book Warlike and Peaceful Societies tries to answer by applying a combination of biological and cultural theories. This new book is the result of many years of research on the mechanisms that drive different societies in different directions – from the most peaceful and tolerant to the most warlike and imperialistic. Warlike and Peaceful Societies will improve our understanding of social developments and make up for the dearth of testable theories in social science. Too many studies have concluded that things happen because influential persons have decided so, without considering the mechanisms that made these persons influential. I am explaining how a lot of social developments happen as a consequence of the combined effect of the actions of a large number of people, often without anybody understanding the consequences of their own contribution to the big picture. A whole society can develop in different directions, ranging from the warlike and authoritarian to the peaceful and tolerant, without anybody actually understanding why. 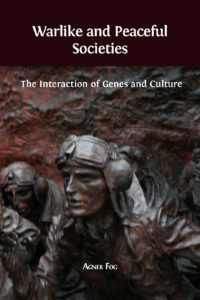 My book presents a new theory that can explain such diversity based on evolutionary mechanisms. There is a well-known psychological response pattern that makes people prefer a strong leader in the event of collective danger, but not in the event of peace and safety. I argue that this response pattern has evolved because it is the most efficient way to overcome the collective action problem in war. This new theory – called regality theory – can explain causal relationships between war or collective danger and a lot of different social phenomena, such as authoritarianism, nationalism, xenophobia, and patriarchy, as well as changes in religious feelings, artistic taste, and sexual morals. The predictions of this theory are tested with statistical data from both contemporary and ancient ‘primitive’ societies. The results of these tests are in excellent agreement with the theory. Regality theory also predicts that powerful political leaders are likely to deceive their own population and exaggerate or fabricate collective dangers in order to strengthen their own position. Warlike and Peaceful Societies offers several historical examples that confirm this prediction. I also argue that the capacity of our society to solve social problems is hampered by the excessive focus on persons rather than structural causes. We are accustomed to finding somebody to blame whenever we encounter a social problem, and the highly competitive news media are reinforcing this tendency for person-centered thinking. We are punishing the scapegoats and removing them from influence only to discover that somebody else takes their place and the problem persists. This applies both to domestic politics and international relations. Many times, we have tried to remove an ‘evil dictator’ by force only to see him being replaced by somebody else who is no less despotic. Likewise, the many attempts to impose democracy by violent means have invariably failed. The so-called war on terror has certainly not reduced the amount of terrorism in the world. Regality theory explains why these political actions have been counterproductive. We need a better scientific understanding of fundamental social mechanisms, and less on blaming individual persons, in order to deal with the big problems that we are facing in the modern world today, such as civil war, terrorism, fanaticism, economic instability, and climate change. Warlike and Peaceful Societies is not an attempt to build a universal theory that explains everything, but it certainly makes an important contribution to a better understanding of the biological and psychological mechanisms behind different social developments. This entry was posted in Author Posts. Bookmark the permalink.